In 1924, he established — with partner John Van Kleek — the firm of Stiles and Van Kleek with offices in Boston, New York and St. Petersburg, Fla. The company continued to be involved in non-golf projects and often subcontracted work from Frederick Law Olmsted’s firm, although Stiles worked primarily on golf-related projects whereas Van Kleek focused on landscape design. Walter Hagen was at one time an associate of the firm. Unlike Ross, who was known to design courses without ever visiting the property, Stiles was known for spending considerable time on his project sites. According to architect Geoffrey Cornish, whose career was just getting started as Stiles’ was winding down, Stiles often spent “weeks and weeks” walking the grounds, before a spade of dirt was ever turned, to “lay out the course with his eyes. He was a master at routing a golf course,” says Cornish. Marshfield CC and Haverhill CC, north of Boston, have both undertaken great efforts in recent years to re-inject “Stiles ” features back into their layouts. 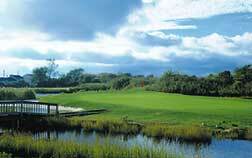 So have Pine Brook and Woods Hole CC, on Cape Cod. Other Massachusetts public courses that retain a distinct Stiles flavor include Mink Meadows on Martha’s Vineyard, Putterham Meadows (now the Brookline Golf Club), Larry Gannon Municipal in Lynn (more than a flavor; a whole meal), Amesbury G&CC (a great 9-hole snack), and Salem Municipal, although again, Ross is often credited with designing this course. Western Mass. could be considered the center of The Stiles Universe. The semi-private Taconic is stupendous (#2 on the NEJG Top 100), as is the front nine at Wahconah, in Dalton; Cornish built the back nine here using Stiles’ routing plan. Nearby, in Lenox, is the Cranwell Resort, Spa & Golf Club, designed by Stiles in 1926. In Vermont, the semi-private Rutland CC remains relatively unchanged since Stiles turned an 1896 layout into the 18-holer. Like Taconic, Rutland shows off the architect’s uncanny ability to lay out comfortable golf holes on severely hilly terrain. Public, Stiles-designed courses dot New Hampshire, as well: funky Mojalaki near Franklin, Dover CC in the south, and Hooper GC to the west. Coastal Maine is a virtual feast of accessible Stiles, with great tracks located in interesting places such as North Haven Island, Boothbay Harbor, Bath, Rockland and Brunswick where, again, a Cornish nine complements the original with great elan. Stiles’ last course, built in 1935, was Riverside Municipal in Portland, Maine. He died in 1953 at his home in Needham, Mass. Not everyone who designed the courses we call “classic” is accorded the honor and respect of, say, Donald Ross, Alistair Mackenzie and A.W. Tillinghast. Architect Wayne Stiles, for example, laid out some 60 courses and renovated 60 more during a distinguished but largely unsung career that coincided with golf’s “Golden Age” of course design (1915-1935). His work was “classic”, to be sure, and most of it was executed right here in New England. But, for some reason, his name fails to elicit the reverence we accord his luminous contemporaries. Stiles managed to fly just below the radar (in the considerable shadow of Ross) all his life. He laid out some of Greater Boston’s best private clubs (Thorny Lea, Woodland, Pine Brook), but none of the name joints — those jobs (Charles River, Salem, Winchester) went to Ross. Stiles pioneered the spread of public golf in New England, designing fabulous nine-hole tracks at relative backwaters like Brunswick in Maine, Wahconah in Western Mass. and Vermont’s Country Club of Barre. However, these and others were eventually expanded to 18 — by someone else, thus obscuring and, in some cases, diluting the fine work Stiles left behind. Stiles’ enduring reputation isn’t helped by the fact that his most famous and decorated course, Taconic GC in Williamstown, is located far from the golfing mainstream in the remote northwestern corner of Massachusetts. Indeed, with its graceful features and strategic brilliance, many who have played Taconic assume it’s a Ross. Their styles were similar; many Stiles courses are commonly mistaken for Ross designs, but rarely vise versa. It was Stiles’ misfortune to work contemporaneously with the famous Scot. However, there are “Stiles greens” (just as there are “Ross greens”) and they can be found all over New England. We may recognize the latter, but it’s high time we learned to identify and appreciate the former. So the next time you’re playing a New England course that dates from the 1920s, keep an eye out for putting surfaces sited upon natural knobs. These are Stiles trademarks, as are fairway bunkers that only come into sight when one’s ball is located. He clearly had a soft spot for blind shots of all kinds: tee shots, approaches, even lay-ups. If these features are present, you may well be playing a course designed by Wayne Stiles, who isn’t a household name in New England golf circles, but deserves to be. Born on June 22, 1884 in Boston, Wayne E. Stiles spent his professionally formative years as a draftsman with the Boston firm of Brett and Hall, ending up as a junior partner involved primarily in city planning and Canadian land subdivisions. He essentially learned the trade of landscape architecture without formal schooling. Nevertheless, in 1915, he formed his own landscape design firm on Newbury Street and became a Junior Member of the American Society of Landscape Architects, becoming a Fellow of ASLA in 1921. By 1916, he had become involved in golf course design — not surprising considering the tremendous boom in course construction at that time. His earliest layouts came in 1916 when he completed nine-hole courses at the Brattleboro (Vt.) and the Nashua (N.H.) Country Clubs. He is not credited with any further golf projects until 1921, his hiatus coinciding with the USGA’s 1916 ruling that essentially removed the amateur playing status of golf course architects who received fees. Stiles was a fine player. For years he maintained a 4 handicap at his home course, Brae Burn, a Ross design in Newton, Mass., where Ross maintained a membership to his dying day. Even at his home course, Stiles couldn’t seem to avoid Dornoch’s favorite son. This USGA ruling was reversed in 1921, and the Roaring 20s were clearly the most prolific for Stiles, as they were for golf course construction throughout the U.S. During this period Stiles would design layouts from Maine (Prout’s Neck GC) to Florida (Lake Jovita CC), and as far west as Missouri (Northwood Hills CC).